Top 5 Reasons Not To Skip Your Winter Pedi! While summer is coming to an end, this does NOT mean your pedicure routine should be as well. Even though your feet look great rocking that new pair of gladiator sandals in the summer, they still take a beating at ~8,000 to 10,000 steps everyday! All of this wear and tear on your feet can be harmful if they are not properly maintained year round. Winter boots & heavy socks can be very compressing on the feet! Toenails which are “hidden” and left to grow wild can become ingrown from the pressure of shoes. Be sure to see your nail technician regularly to keep them neatly trimmed. And while winter may not be all about the bright pink polish, it's still easy to accidentally let a trendy dark polish remain on your toenails during the winter months... which gives toenail fungus a free pass to develop under that old coat of chipped polish. Consistent pedicures can help your certified nail technician detect signs of corns, bunions, and even fungal infections. Conditions like these are easier to treat when they are identified in early stages. Clipping, filing, and cleaning the toenails prevents scary ingrown toenails, which can cause serious pain and infection. Getting rid of dirt and bacteria will also help prevent fungi and even those dreaded foot odors. Healthy, strong toenails also protect the toes from that sneaky, midnight snack toe stubbing!! 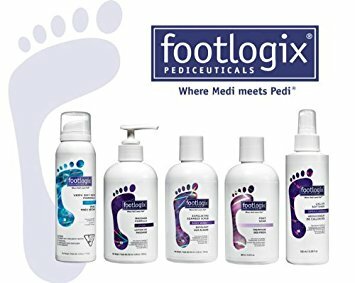 Our pedicures start off with a warm Footlogix Foot Soak and include a massage using a Footlogix massage formula catered to your specific needs, along with customized essential oils, which help preserve the moisture and integrity of your feet. Hydrated feet are less likely to get blisters or cracks. Keeping your cuticles moisturized will prevent nails from growing with ridges or splits which can cause the nails to lift out of the nail beds. Using the Footlogix Seaweed Scrub prevents the skin cells from accumulating and causing corns, which can be very uncomfortable and even painful. The removal of excess dead skin on your feet, especially on your heels, encourages new growth creating smooth, naturally beautiful feet. The most enjoyable part of your pedicure, which I think we can all attest to, is the massage! Massage helps promote circulation while releasing tension in the calves and feet. Increase in blood circulation can reduce pain and distribute heat throughout the body. A pedicure helps relieve stress and can be very therapeutic as well! It eases tension and stiffness throughout the body and enhances your well-being. Beyond having pretty feet, and relieving stress, winter pedicures protect your skin from several dry skin related problems. Regular pedicures, even through winter months, can be very beneficial, for healing cracked heels, which if ignored for a long time can be painful and cause discomfort. REMEMBER: It’s important to make sure you don’t sit about with wet socks during snowy months!! Wet socks are the quickest way to get athletes foot and other foot fungi, so make sure you take them off as quickly as possible. Feet receive little care compared with other parts of our body, like our hands and face. Healthy feet are VITAL to our overall health, so don’t neglect them. Make sure to a pedicure at least once a month so your feet stay in perfect condition!